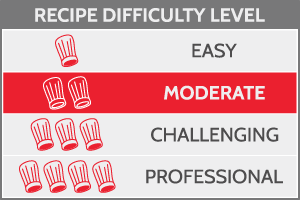 Scale out all ingredients and in a blender; combine together and pulse for 10 seconds. 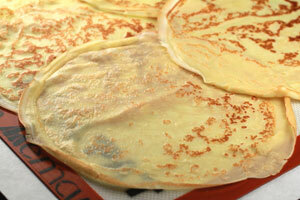 Place the crepe batter in the refrigerator for 1 hour to rest. 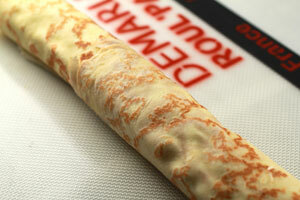 This allows the bubbles to subside so the crepes will be less likely to tear during cooking. Heat a small non-stick pan. Add butter to coat, remove excess. Pour 1 ounce of batter into the center of the pan and swirl to spread evenly. Cook for 30 seconds and flip. Cook for another 10 seconds and remove from heat. Let the crepes cool down completely. Take care not to let them dry out. To make the parmesan cream, warm the crème fraiche, add the cheese and let infuse a few hours at room temperature. Strain, cover and place in the refrigerator for a couple of hours. Whip in a mixer until you get a nice light consistency. Do not over whip, the mousse will split! Transfer the parmesan cream in a piping bag. Arrange the crepes on the Roul'Pat. Overlap the edges of the prepared crepes so there is complete coverage. Outer edges can be trimmed for a uniform rectangular shape. Pipe the parmesan mousse onto the crepe's surface. An offset spatula can be used to even out the filling. 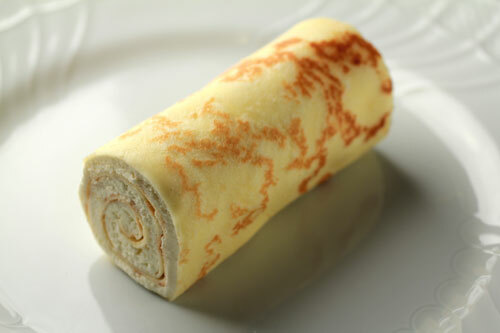 Gently roll up the crepe with parmesan mousse. Use the Roul'Pat to shape a cylinder log. Refrigerate to allow mousse to set a bit. Trim the edges. The roll can be cut into individual servings.